The Bank of Ceylon was once again recognised for its HR excellence at a series of awards ceremonies (through three wards). It was recognised as one of Asia’s Best Employer Brands for 2018, as one of Sri Lanka’s best employers brands and was also highlighted as one of the “Best HR Organisations to work for”. These awards were offered at different intervals by the Employer Branding Institute India and the ceremonies were hosted by the World HRD Congress. The Asia’s Best Employer Brand Award ceremony was held in Singapore with the participation of many reputed organisations across Asia and the Sri Lanka’s Best Employer Brand 2018 ceremony was held at the Taj Samudra Hotel Colombo recently. 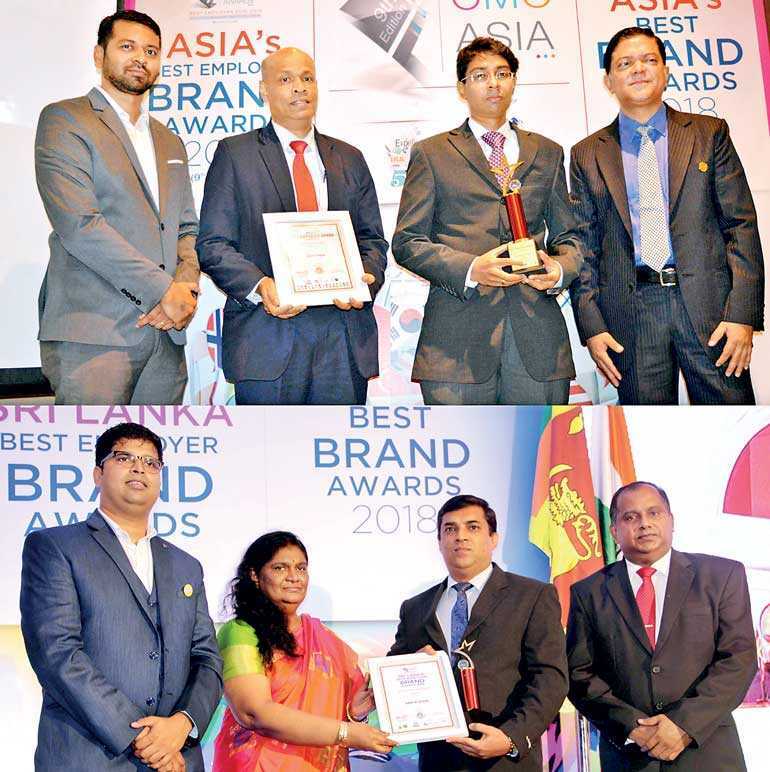 The Asia’s Best Employer Brand was received for the third consecutive year and Sri Lanka’s Best Employer Brand award was received for the second consecutive year. Being in a highly competitive service sector, the Bank thoroughly believes its Human Resource is the key element behind its success. The Bank’s HR policy ensures that it maintains a culture of contribution and innovation at work; consistently improving the HR Policy by measuring organisational health and inculcating values that help to achieve its vision; being a Social Employer and developing future leaders in the organisation. Becoming one of the Best Employer Brands in the country for the year 2017 recognises the effort the Bank took to effectively manage over 8,000 workforce and drive them to reach the Bank’s strategic goals and maintain itself as the country’s No.1 Brand and No.1 Bank. With the stability that has been proven over 79 years the bank has demonstrated market leadership in many areas of banking and pioneered to transform the Sri Lankan banking and financial landscape significantly. Currently, The Bank of Ceylon counts for over “three trillion” in its balance sheet in Assets, Deposits and advances. With the extensive branch network and customer touch points that consist of 627 branches, 15 SME Centres and 733 ATMs/CDMS that are spread across the country. In its customer service, the Bank identifies and acknowledges the customer needs of each socio-economic segment in every part of the country. This has been enabled, mainly through the knowledgeable but diverse workforce that the Bank employs. It is the staff strength and capacity that was demonstrated through every achievement of the bank. Receiving these awards is evidence of the soundness of the strategies that are in place and the effort that the bank puts into managing the highly diverse workforce it has.